Dainius Puras is the Head and Associate Professor of the Center of Child Psychiatry and Social Pediatrics in Vilnius University. He is also teaching public mental health and health policy in the Medical Faculty and in the Institute of International Relations and Policy Studies of Vilnius university. Dr. Puras was one of the founders of the Lithuanian Psychiatric Association and was the first President of this Association in 1990-1992. He initiated the Lithuanian Welfare Society for Persons with Intellectual Disabilities and the Child Development Center in Vilnius. Dr. Puras was a Dean of Medical Faculty of Vilnius University in 2000-2002. He has served as an expert and a consultant for governmental agencies and nongovernmental organizations in 12 countries of Central and Eastern Europe in the fields of mental health policy and services, child and adolescent mental health, deinstitutionalization and development of community based services for children, youth and families at risk. 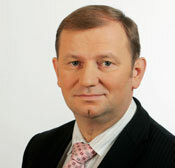 Dr. Puras is the Chairman of the Board of Human Rights Monitoring Institute in Lithuania. He is also the Chairman of the Board of Global Initiative on Psychiatry. In 2007, Dr. Puras was elected and serves as a member and expert of the UN Committee on the Rights of the Child. ‹ Vladan Novakovic, M.D. › Wieslaw Jerzy Cubala, M.D., Ph.D.